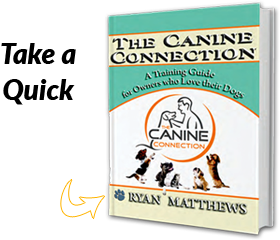 Read dog’s body language to improve your communication with it. Too frequently I see people forcing dogs in uncomfortable situations. Generally, it is because people try to push their intentions onto the dog. For example, trying to force a timid or shy dog to receive being petted. Guys and gals not all dogs are social. Similar to people some are outgoing whereas others are a bit more shy. Dogs are the same way, being able to read a dog’s body language will better arm you with understanding if a dog is receptive to interacting. Here are two dog body language examples of shy dog cues (agreement and avoidance.) Please familiarize yourself with these examples so you can better read dog body language, they will thank you for it! Agreement/Engagement : Myself, Ryan Matthews, the dog trainer specialist I often see people forcing their will upon dogs. in my opinion, it is good to consider if a canine is in agreement with one’s intentions. I understand there are times where it is non-negotiable and we must insist our dog have it our way. However, if at all possible, look for opportunities to interact when your dog is willing to participate. The body signs of agreement are similar to relaxation; the dog will demonstrate a loose relaxed tail and open mouth. In the example of petting a dog, it will lean into the handler. It will appear as though it can’t get enough of the attention. Do not force your pet into doing something it is not ready for or is uncomfortable with, although there will be plenty of times that dogs will have to just work through the stress. As long as their health and safety aren’t at risk, some pressure and stress are okay. An example of this would be teaching a dog to swim. Not all canines are like labs and love the water. As long as the teaching is fair and simple to complex, if the dog is not giving agreement signs, in order to progress, he will have to work through his mental stress. A great characteristic of dogs is that, generally speaking, they recover well; as long as we don’t make things a big deal, neither will they. Agreement: This is more of a lack of agreement. 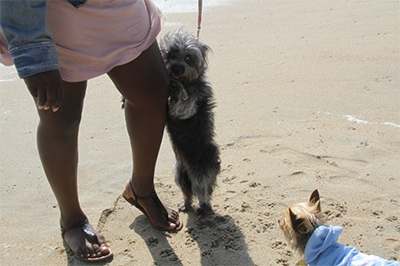 Trying to climb up the owner’s leg is clearly saying, “I do not agree with this other dog’s intentions.” The dog on the left is lacking in social skills. The owner should not pick the dog up to comfort it, but she could continue to move along. Avoidance : A dog in avoidance is trying to communicate they are uncomfortable with the current situation. Some dogs have far more tolerance of difficult situations than others. To train extreme avoidance out of a dog, it takes tough love and thinking of the bigger picture. A typical time that a canine demonstrates avoidance is when fireworks go off. In order to help your pet grow, you cannot reinforce the avoidance, otherwise you are promoting it. Some of the ways a dog conveys its avoidance mind set are: looking away, hiding underneath furniture, ears pinned back, and a low tail/tucked tail. Avoidance: The small white dog is well aware of the Husky in its area. 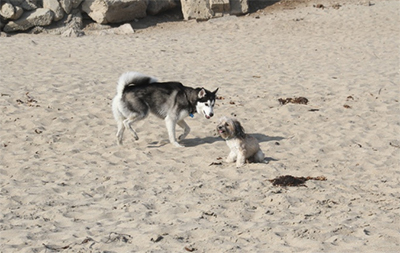 It may appear that the little guy is ignoring the Husky, however, ignoring is considered a polite and acceptable behavior, the small dog is in avoidance. He is sitting in an effort to deter the Husky from sniffing him. These two reading body language examples are important to be able to identify because these guys are shy. The last thing we would want to do is pressure a fearful or timid dog to feeling even more tense. Remember that you don’t want to force your interaction unto timid dogs. Allow the dog the opportunity to sniff you. After all, that is how dogs shake hands. Additionally, try to not talk too much it will only overwhelm the dog. Reading dog body language is a great skill for you to have. You will be able to speak canine language. As a reminder, dogs interact 80% non-verbal, therefore, most of their communication is done by offering various body language cues/signals.